Gymglish is a Paris-based company founded in 2004. We offer innovative learning solutions online using personalized content, an expert learning system and a team of creative content writers. Our aim is to keep learners engaged and motivated thanks to fun, short, content personalized to their needs. Our courses are used by over 4 million people worldwide, including over 6000 businesses and 400 partner schools and universities. 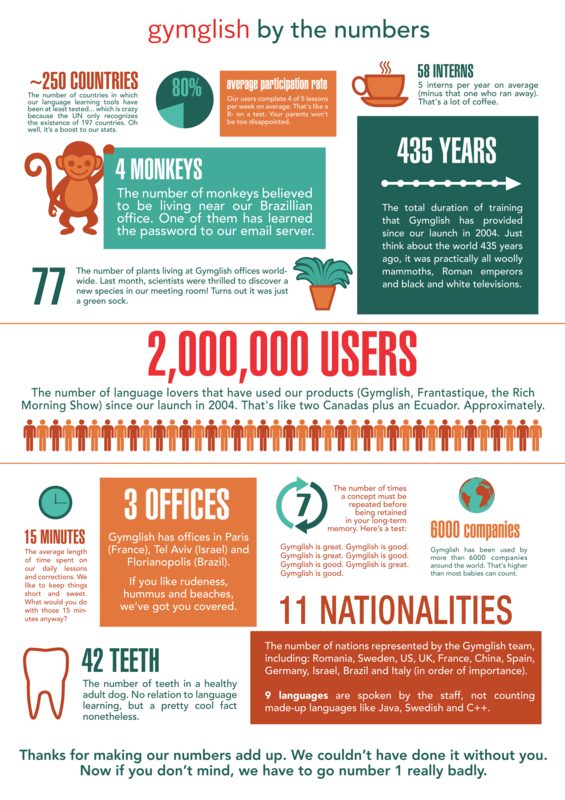 The Gymglish team is made up of 40 people of 16 different nationalities. We speak 14 different languages (not including made up ones like Java, Swedish and C++). Our head office is based in Paris (France). Some of our team also work remotely from Bordeaux (France) and Tel Aviv (Israel). Learn more about us.